In recent years Stonewall Democrats have created a big picture strategy of being very involved in changing the party from within including a concerted effort to send members to this year's convention as delegates. Looks like it worked! 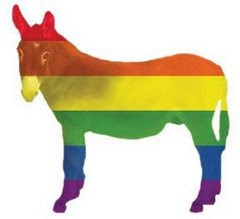 A record number of GLBT delegates are expected to arrive at the Democratic National Convention later this month, says the National Stonewall Democrats – the nation's largest Democratic organization representing gays and lesbians. This is the real long term story of the election year, more people, more involved, from a wider variety of communities across the country. The message has finally seemed to swell up from the 50 State Strategy. (thanks, Howard) We can't leave it up to the Beltway Bobs and Bettys. If we are going to restore our nation and our party we need to get involved and empower everyone to be a part of the process.